Night Watchman Keychain Baton | BUDK.com - Knives & Swords At The Lowest Prices! 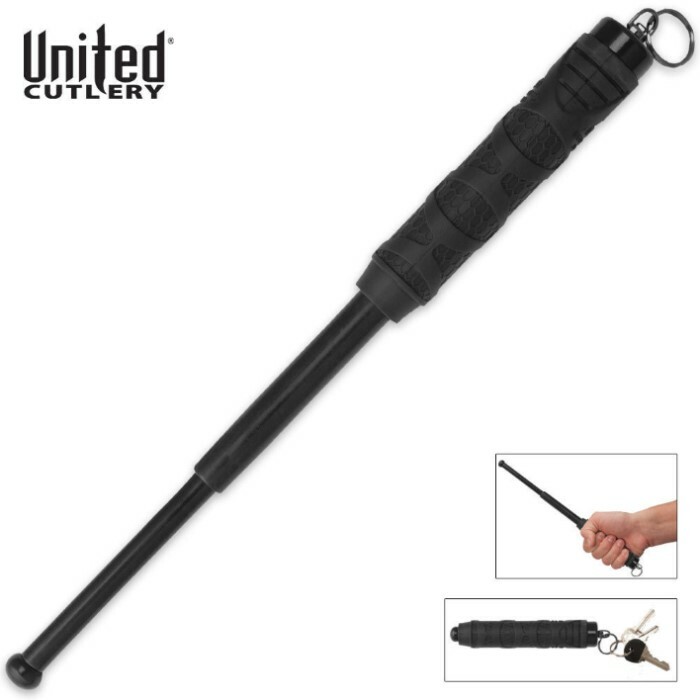 This Night Watchman impact baton is easily carried on your keychain! It can be rapidly deployed into action with a quick flick of the wrist. It provides the carrier with a confident attitude that he or she carries a powerful deterrent to ward off any attacker. The baton affords superb balance and control, and offers a rounded impact point that will apply significant pressure to an attacker without inflicting any cuts. Night Watchman Impact Baton - 21"
After only a few times picking it up randomly and occasionally swinging it around and closing it again (really not even hitting anything) the smallest section wore down enough paint and metal to come flying out the front when I flipped it open. Otherwise the handle and heft feel very good if you don't mind playing roulette with your feet and furniture wondering if the end will fly off. Love this item fits perfect anywhere. Nice self defense tool. Good weight and does good damage if needed to. Only 4 out of 5 stars because when I have it in my pant side pocket, it wants to slip open. But a nice buy !!! The bottom line is: you could definitely kill someone with this thing, if that's what you were trying to do; otherwise, you could easily break a bone or at the very least scare the hell out of someone. What can I say, it's basically like carrying a 12" pipe... probably because it is. As far as batons go, it's probably junk. It was my first baton, so I practiced using it a lot on my heavy bag, and after a short while it started to bend. Now it has a lot of trouble opening and closing. If you're only reason for getting this is that one day you might need to whack someone, then go for it. If for some reason you expect to get a lot of use out of this thing, you might as well spend a bit more and get something that will last -- perhaps a S&W, or an ASP if you really can afford it. All in all, you could fend off any unarmed assailant with this. You could probably take someone with a small knife... if your attacker has something more substantial, like a bat, a large knife, or even a gun, I don't know if this would do you much good. I generally like this, BUT and it's an important BUT that would prevent me from buying it if I had known to start with. It is that the shaft does not securely lock in the closed position. I have even carried it downside up and it still pops open. I don't know how long it would stay locked closed if carried as a key chain, but I know it would constantly pop open. I just received my baton. I am pleased with the construction and function. It is too large for an average pocket but will be OK in a bag or purse. Another BudK Best Buy Item. Thanks, keep them comming. This baton was impressive right from the box. I am pleased with how solid it is, considering how relatively compact it is. The rubberized grip feels great in your hand. This baton is pretty discreet and stays locked very well, but when needed it will open up quick and stay locked out. Glad it doesn't slide back down. Have to tap it on the ground or tap it with a hammer to get it back down. So far seems very durable and used on a heavy bag for training.